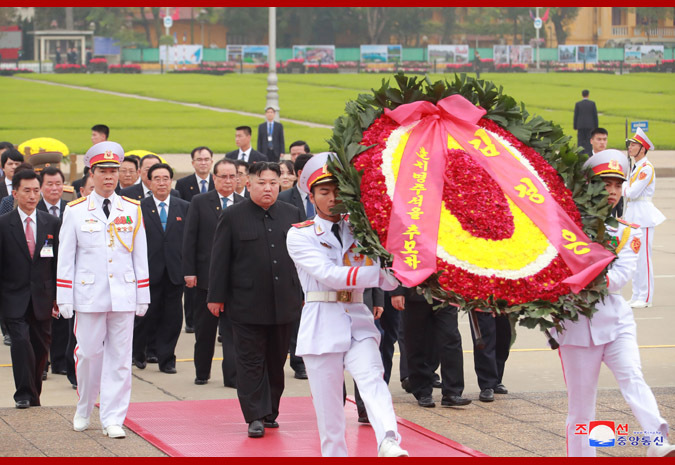 Kim Jong Un, chairman of the Workers' Party of Korea (WPK) and chairman of the State Affairs Commission of the Democratic People's Republic of Korea, laid a wreath before the mausoleum of President Ho Chi Minh on Saturday morning. Among the visitors were Kim Yong Chol, Ri Su Yong, Kim Phyong Hae and O Su Yong, members of the Political Bureau and vice-chairmen of the WPK Central Committee, Ri Yong Ho, member of the Political Bureau of the WPK Central Committee and foreign minister, No Kwang Chol, alternate member of the Political Bureau of the WPK Central Committee and minister of the People's Armed Forces, Kim Yo Jong, alternate member of the Political Bureau and first vice department director of the WPK Central Committee, Choe Son Hui, vice minister of Foreign Affairs, and other cadres. 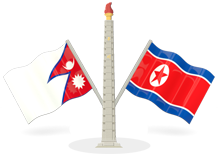 Present at the wreath-laying ceremony were Dao Viet Trung, director of the General Office of the Presidency of the Socialist Republic of Vietnam, and Le Ba Binh, Vietnamese ambassador to the DPRK. Supreme Leader of the Party, state and army Kim Jong Un laid a wreath before the mausoleum. He paid a silent tribute to the memory of Ho Chi Minh. Supreme Leader Kim Jong Un laid a wreath at the Monument to Heroic Martyrs on Saturday morning.